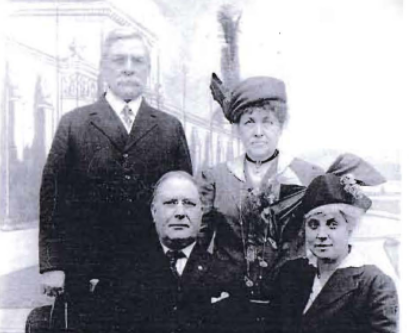 I have created this website for anyone with interest or stories about the Broderick family, the Bascom family, or the business Broderick & Bascom to stay in touch, and to be able to share stories or memorabilia. Heres what I found in reading some of the Golden Jubilee Publication. I have posted the full file online, and it is large. Link below. 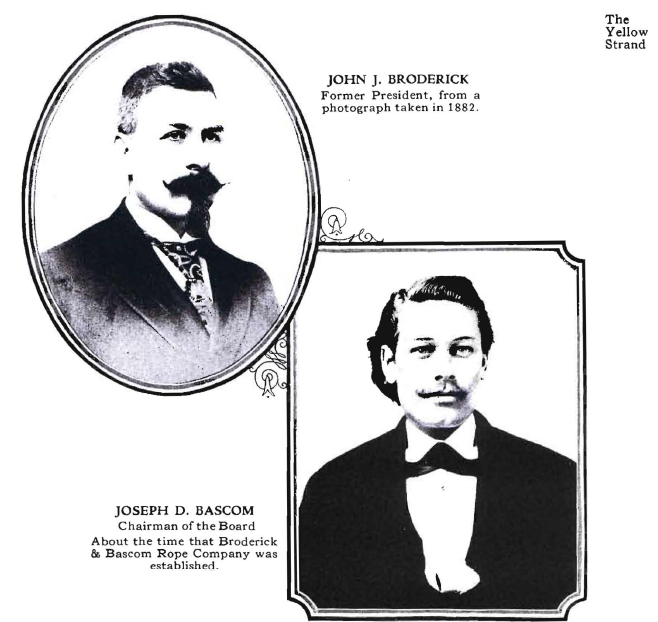 When JJB (John James Broderick) was 20 and Joe Bascom (JDB) was 18 they both worked at St Louis Railway Supply Company JJB was a shipping clerk and Joe was a billing clerk. 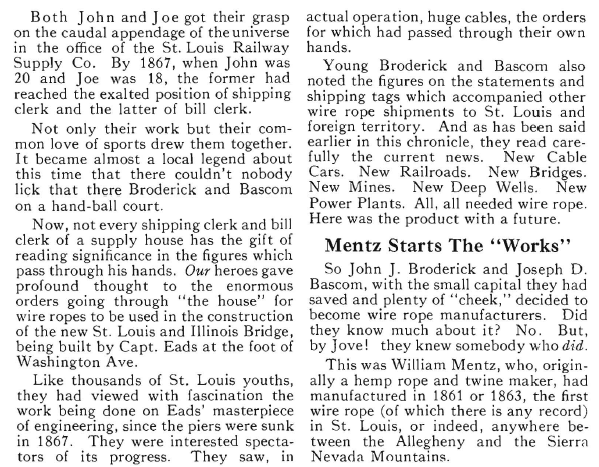 They saw the tons of wire rope invoices passing thru because of the Eads Bridge being built. They decided to join forces and start the company. 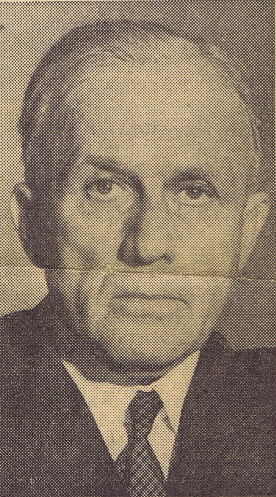 To their advantage, one of the heads of the main competitor wire rope company had recently died in 1868. JJB and Joe made a deal with the remaining partner. B&B was established 1875 and started manufacturing in 1876. 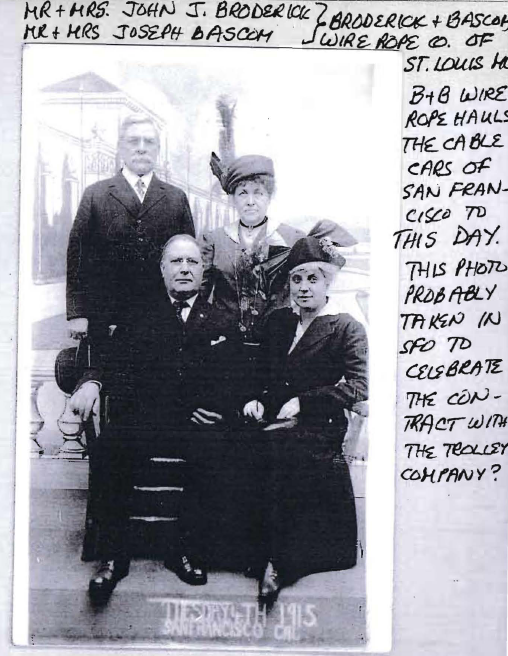 Anne Bryan Broderick notes this picture was most likely taken in San Francisco 1915 when they signed the contract for the cable cars. Anne notes that B&B cable hauls the cable cars of San Francisto today.